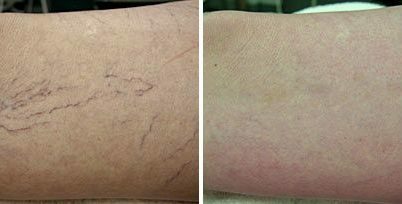 Vascular lesions are blood vessels that are visible through the skin. The harmless lesions look blood-colored, with either a red or purplish hue. Standard types of vascular lesions include: spider veins, telangiectasia, port wine stains, and hemangioma. They can occur on almost any part of the body, but are especially common on the face or legs. Fotona’s long-pulse Nd:YAG lasers penetrate to a depth of 5-6 mm into the skin, allowing for highly effective treatments for the removal of many types of vascular lesions. As the Nd:YAG lasers create homogenous heating that affects the blood vessels only, this results in the blood vessel to coagulate without affecting the blood vessels. How does Spider Veins Treatment work? For treatment of vascular lesions, pulses of Long pulse ND:Yag laser light are directly applied to the entire area of the blemish. The veins and capillaries of the lesion absorb the laser’s energy while the surrounding skin tissue does not. The treatment causes the exposed vessels to break down and become less visible. Procedure time for vascular lesion treatments depends on the size of the lesion, but never takes more than a few minutes. Small vascular lesions can often be removed in a single treatment, while other lesions may take several treatments to become less visible. Regardless, most patients see significant improvement in appearance after a single laser session with Fotona SP laser.